Zucchini lasagne is a thing these days. So says Pinterest, and Pinterest knows everything. The idea is for paleo eaters to swap out the nasty grains for thinly sliced zucchini, or as we call them in NZ (and France), courgettes. As I'm not a nightshade eater, this version has no tomatoes, however I served it to guests with a tomato sauce poured over it, and lots of cheese. There were no complaints. -500g lean beef mince. I only use Lake Farm Beef, and would recommend them to any kiwis. The farm is owned by an old friend of mine (meaning we have been friends a long time, not that he is old), and animal welfare is top priority. - Put the oil in a hot frypan, then sautee the onion and garlic until slightly soft. - Add the meat, thyme and salt stirring intermittently until it is slightly browned. Keep breaking up the mince so that you don't get chunks. - Add all other ingredients, cover and let it cook while you prepare the zucchini. - Slice the zucchini finely and layer into a baking dish. 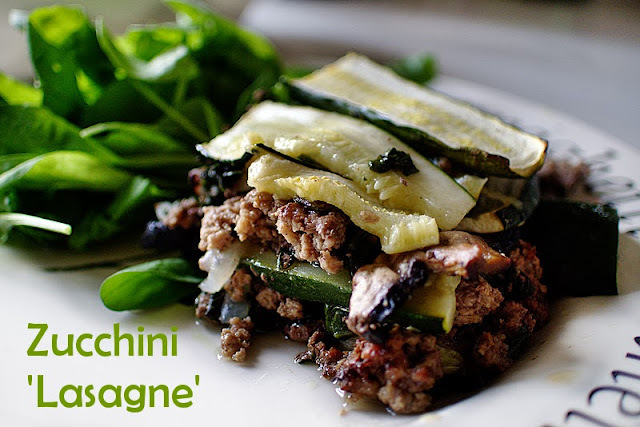 - Assemble layers of zucchini and meat mix, making sure that each layer is fully moistened as you go. - Bake for 30 minutes at 180C. If you are on a low FODMAPS diet, you'll need to leave out the onions and garlic (high in fructans) and perhaps the mushrooms (high in polyols). The basic idea of this layered veg/meat combo would work with any vegetable that can be sliced. I think a version with kumara or pumpkin is definitely in my near future. Today is the first day post-AIP and I had anticipated a splurge of caffeine, wine and chocolate. 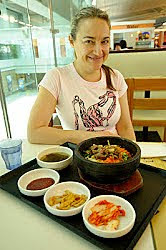 Instead, the worst I could do is Thai food for dinner, which gave me a tremendous stomach ache. I had an espresso this morning which did nothing for me. I've noticed that before with coffee. Once the addiction is over, there is no buzz. This makes me think that the zing is nothing more than a relief of coffee withdrawal. I'm mulling over the idea in my brain of giving up alcohol permanently. It seems like a radical idea. The main reasons are that I feel generally happier without it, and I wake up earlier with no desire to go back to sleep. Also, with the crazy season coming up, it may be easier to abstain than to try and moderate my consumption when surrounded by drink bullies. I'm thinking that over. Are any readers non-drinkers? If so, I'd love to hear your reasons, and how you manage it. I love a veggie layered "lasagna" too. I do mine with alternating layers of zucchini and eggplant - but of course, eggplants are nightshades, so that wouldn't work for you. People on a low-FODMAPs diet can cook with garlic-infused oil, which works a treat. You get all the flavour, but none of the nasty fructans. I'm discovering that I have a tolerance level for onion, which is one less menu hurdle to negotiate when eating out. I took a pledge about 5 years ago to never give my money to the alcohol industry after I found out an alcoholic drink has been formulated to appeal to the palate of 11 year olds i.e. milky and chocolatey. This is because these children are too young to like the taste of alcopops (source: Prof. Doug Sellman, Professor of Addictive Disorders, Otago School of Medicine). This knowledge keeps me sticking to my pledge. Congratulations for considering giving up alcohol! How is it going now? I don't drink mostly because I am frugal and general don't like the taste or the effects I see in others. Love this blog post. Well, I have not given up, but am holding at a couple of glasses a week. That's good enough for me ;) It does take discipline though, more discipline than when I was not drinking at all. I also do not drink since I received news that my liver is sluggish and congested, I'm infertile in early menopause, have candida, and still testing for more conditions. I don't think I'll ever want to drink again, my life has improved without it on so many levels, like, it no longer interferes with my emotions, I have enough to worry about than to add a depressant to my troubles; I know abstaining is easing my liver burden, I could go on. Also, for those who think you can't have fun without alcohol, watch this absolutely eye opening and uplifting episode of The Health Bridge Podcast with Dr. Sara Gottfried and Dr. Pedram Shojai, interviewing their guest James Swanwick, It's called Having Fun Without Alcohol. It's one of my favourite episodes and really made me open my eyes to the fact that I wasn't missing out by not drinking but rather, I was joining in on better and dare I say smarter conversations. Thanks for your comment Lisa, and for that link. I'm watching it right now. I think part of the reason I did not give up entirely is because I find some social interaction to be stressful! I'm socially awkward and alcohol settles my anxiety a bit. I know there's a better way, but my drinking is really moderate these days. My brother has given up alcohol completely for about a year now and loves the new him. He looks fantastic too.